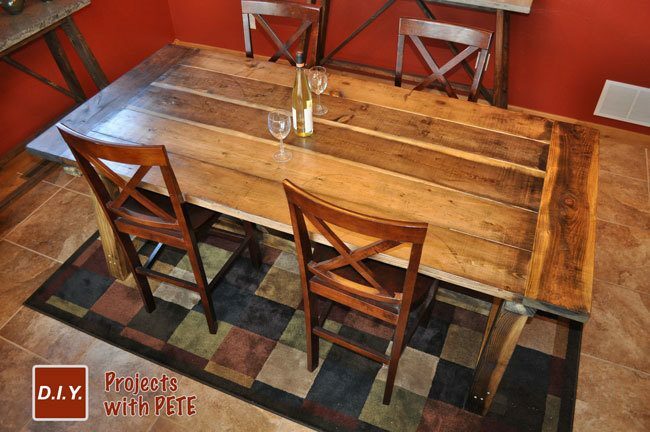 The other day I was browsing projects on Ana White's website and came across a dining table I had to have. Sooooo…. 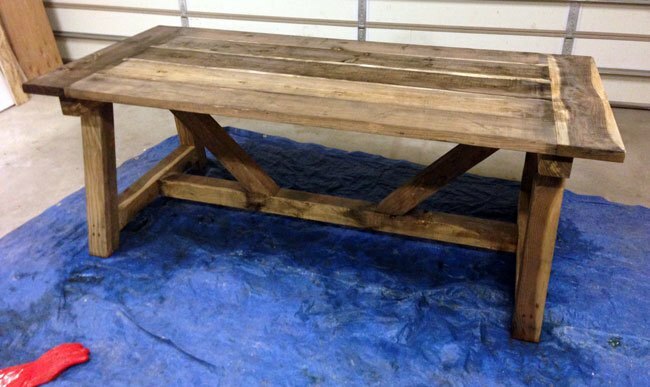 a couple days later I have a completed and beautiful new table for dinner parties and meals. 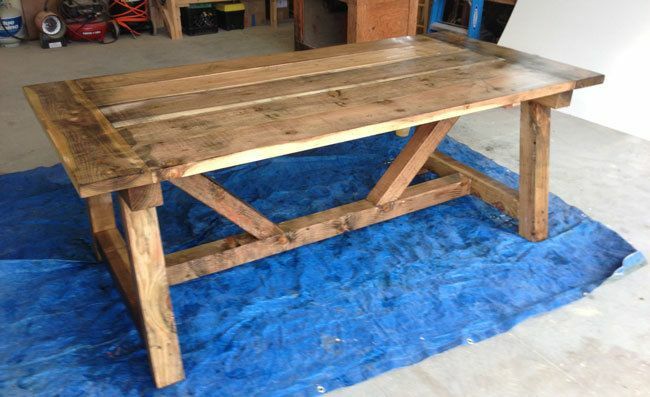 This table can be built for around $120-$150 and is built out of 2×4, 2×8, 2×10, and 4×4 construction grade Fir wood. UPDATE – THIS IS A NEW VIDEO I MADE. It is not the same size as the table in this post. But very similar. The complete plans can be found on Ana's site and there is a downloadable PDF. Ana White and Whitney from Shanty-2-Chic partnered on creating the plans. 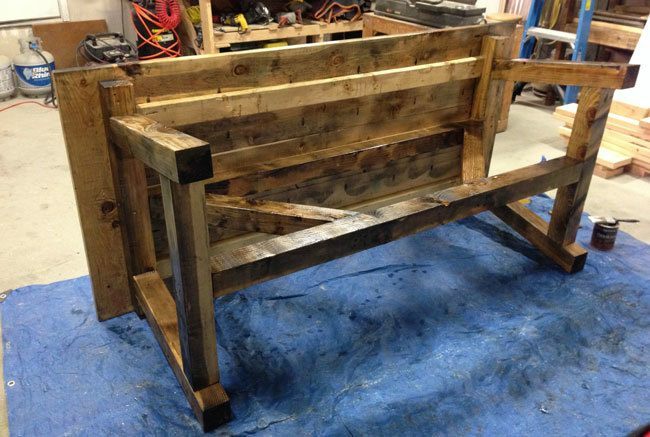 The project is fairly simple and will take about a day to assemble + finishing time. Plans can be found on Ana's Website. More photos and ideas can also be found on Whitney's website. Modifications: The only modifications I made to Ana's plans were for the top. I used four 2×8's and 1 2×10 for the top of the table. I used a 2×8 for the breadboard ends as well. 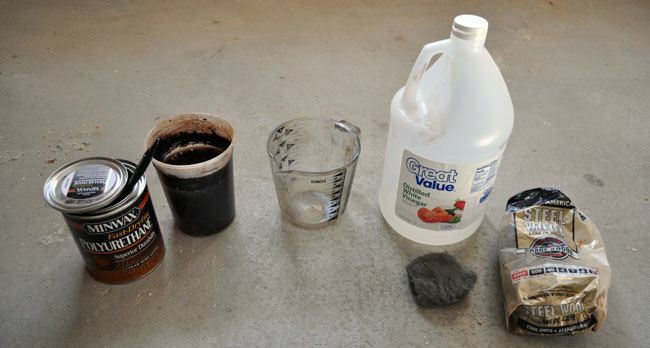 #00 Steel Wool and White Vinegar – Put a handful of steel wool in a jar and add white vinegar. Let the vinegar dilute the steel wool for at least a couple days. The mixture will get darker the longer you let it sit. Once diluted, simply paint the mixture on your piece. 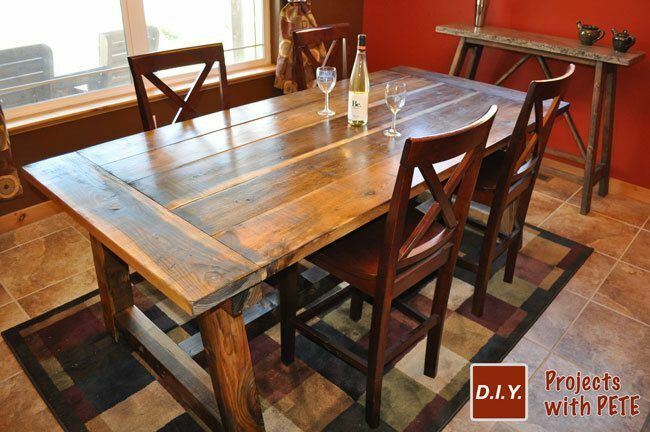 Oxidation will occur and the mixture reacts with the tannins in the wood to give it variations in color. It changed the Fir wood to dark blues, greys, browns, and black. Do not use white Pine because it will not darken much at all. * You can always dilute your mixture if it is too strong. Simply pour a little of the strong mixture in a new cup and add white vinegar. First, I built the two ends out of 4×4's. I bought 5″ and 6″ long torq screws to connect them. Connect the two ends together with the 4×4 horizontal beams on top and bottom. I didn't have an extra set up hands to help me, so I used Jack Clamps to help hold everything up while I tied the boards in with 6″ torq (also known as star) screws. Check out my resources page for more info on the JackClamp. 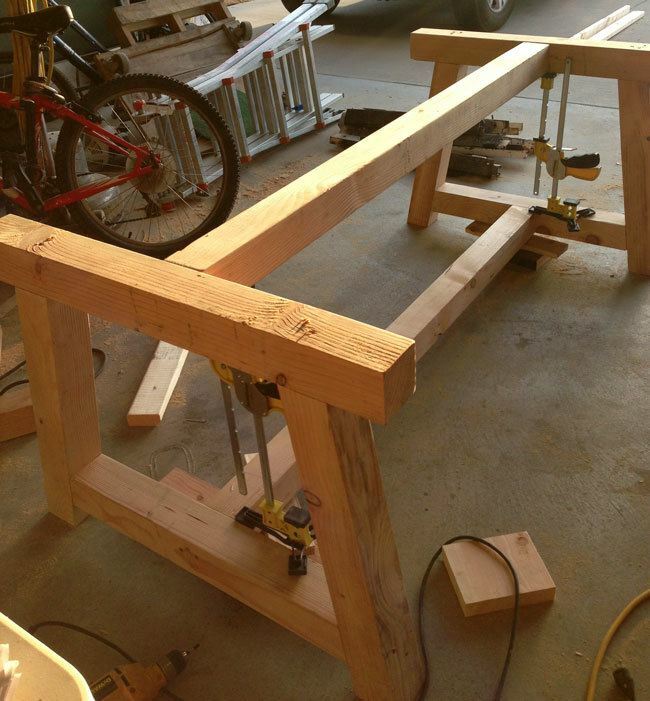 * I do not have a photo of the next step, but connect the two 2×4 horizontal boards on each side of the top horizontal 4×4 beam. Next, make your breadboard top out of four 2×8's and 1 2×10. Ana's plans call for all 2×10's, but I wanted to use 2×8's because they are easier to work with. I don't have a photo of the process, but if you go to the 11:18 mark on the video below you can see the process involved with attaching the top boards. 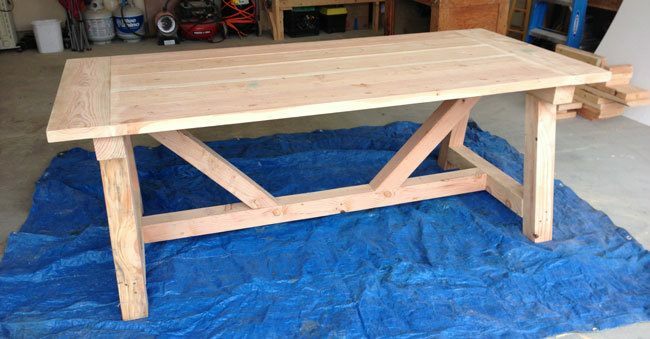 You will need a Kreg Jig and 2.5″ Kreg screws for this process. 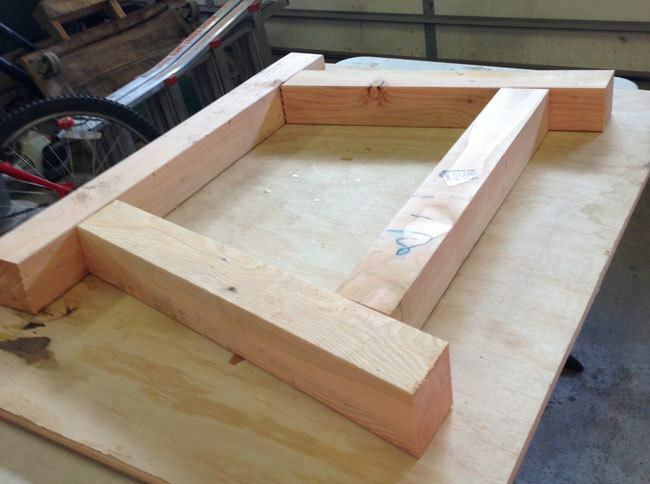 Once the top is assembled, center it on the base and attach to the base from unnderneath. Use 4.5″ screws to connect the 4×4's to the top and 2 or 2.5″ screws to anchor the top to the 2×4 horizontal boards. Once assembled, it will look like the photo below. 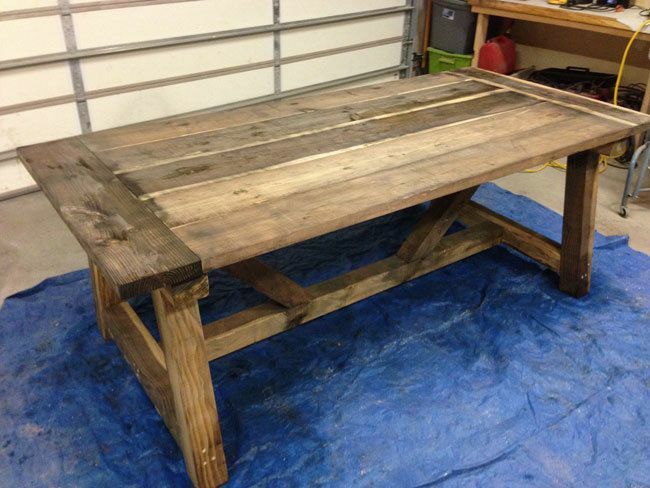 Next, grab a brush and coat the entire project with the steel wool and vinegar solution. After 20 minutes the table darkened up quite a bit. It continued to darken over the next 1 to 2 hours. 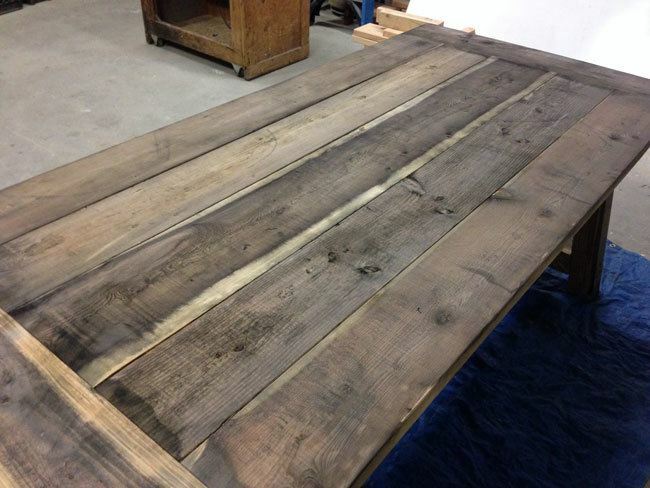 Once it has darkened, let the table dry completely. If you missed any spots, simply grab your brush and go over the spots you missed. Below is a photo of the table after about 45 minutes. *I like to flip the table on it's side to get underneath. — Although it is not necessary to get everything if you don't have the time. Below is a photo of the table after 1 hour and 15 minutes. The table darkened up quite a bit. 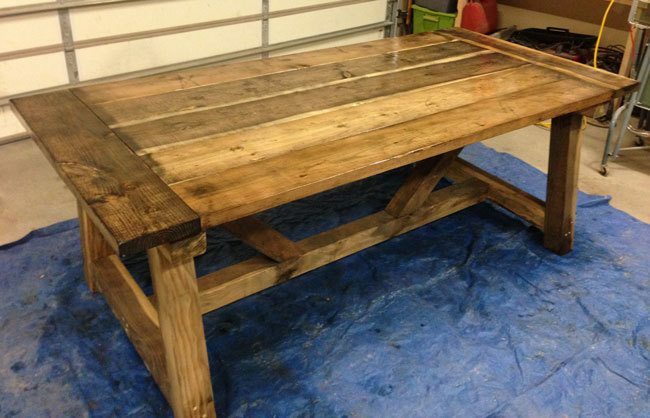 You'll notice I distressed the table a bit by scratching it, hitting it with a hammer, and using a punch tool. The table looks a little dull without a sealer though. So, I grabbed some Minwax semi-gloss polyurethane to finish up the piece. 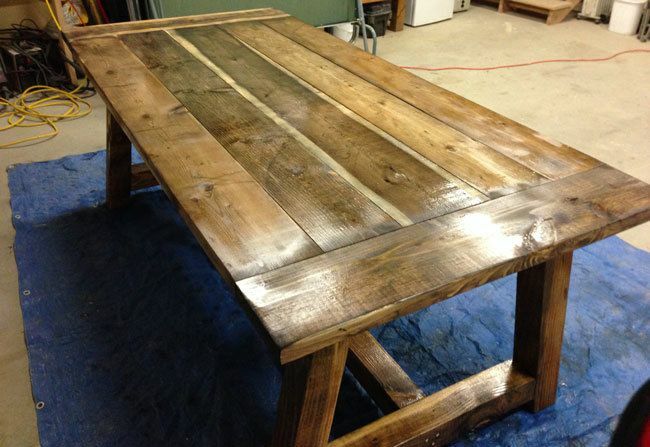 Photo of the table once it has completely dried and reacted with the vinegar/steel wool solution. Next, grab your Minwax Semi-Gloss Poly and brush on one coat. After the first coat it will look like the photo below. 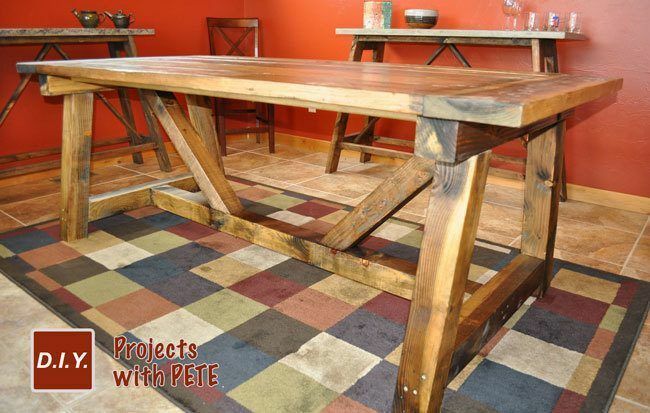 The poly warms up the table and brings out the honey color of the wood. Brush on a second coat of poly after the first has dried. The table will have a more protective finish and you'll be able to even out some of the spots that absorbed the first coat. After the second coat, I let the table dry completely. Then, I took a 400 grit sanding blog and quickly sanded the top surface and legs. This smooths out any bumps or dust that may have dried in the finish. After sanding, take a damp rag to clean off the sawdust. Lastly, use a clean rag and wipe a very thin 3rd coat on all of the parts you sanded. This will give the table a final shine. Let the table dry and air out for awhile. 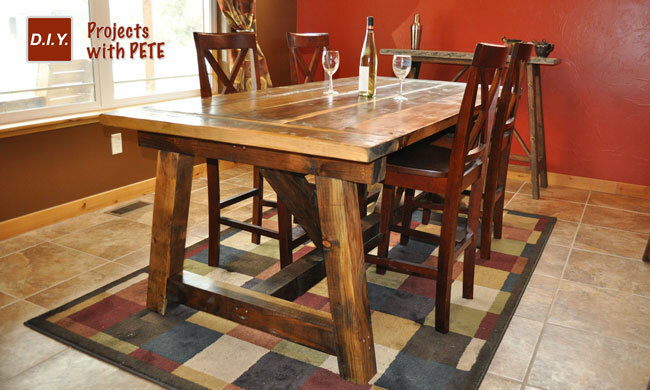 Last but not least, carry your table in the house and enjoy! Not bad for about $120-$150 in materials!